The extraordinarily versatile Don’t Tread On Me All-Purpose Field Knife is the perfect addition to your hunting gear, toolbox or bug-out bag. The thick, razor sharp blade can be used for demanding tasks like cleaning wild game, building shelters, splitting firewood or simple day to day cutting jobs. 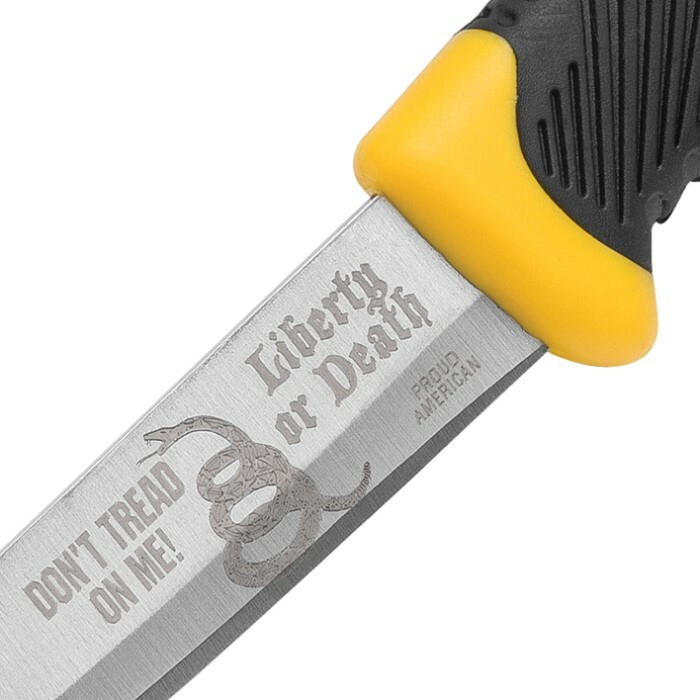 It features iconic “Don’t Tread on Me” artwork laser-etched right onto the blade. An overlaid black and yellow rubber handle with checkered pattern allows for a firm grip, even in wet situations. It even includes an ABS sheath with belt clip to safely transport the knife when not in use. Don't miss out on your chance to get one of these great knives at an impossibly low price! They won’t last long! As others say these are fantastic for the money. A few months ago I was eating at a fancy steak house and the knives they gave to us had a large handle, I had already ordered one of the Wahoo-Killers (Blue handle) but when these came out at $2.99 and free shipping, I replaced my old Steak knives with them. I hadn't heard anyone else say that but they make great knives for dinner cutting thick steaks chops, Ham Steak etc. As someone else said they sharpen pretty easily, They aren't the hardest of blades but you can use them for just about anything. They will take an edge that is shaving sharp so if I go on a boat fishing I'll take my Wahoo knife. If I lose it? Big deal! This really is a all purpose knife. It's easy to sharpen and the price can't be beat. I keep one in kitchen, one in my tool bag and one in my hunting pack. It is easy to use wet or dry. And very well made. I really like this knife! Makes a great addition to a bug out bag, your vehicle, the shop, or tackle box. I have given several as gifts; they ask where I got them because they want more. A great cheap everyday use knife. They are cheap enough to have multiples everywhere you need a knife. I abuse mine and they hold up better than my $50 name brand blades. Very happy customer. Best value knife on the internet. Can't beat the price, especially for this level of quality. And mine actually has correct etching, even though I paid the oops price.